Pizza is always one of those things you can rely on. Bread – good. Cheese – good. Sauce – good. All of the other customizable toppings – good. I love classic flavors like cheese or margherita or trying the less conventional like potato pizza or corn as a topping. If a city has its own spin on a pizza – you know I’m gonna try it, and I love them all from fat slice to deep dish. One of the best days of the year is tomorrow – National Pizza Day! A bunch of different ice cream spots are offering deals or discounts, though this post is just about showcasing a few of my favorite places to grab a delicious slice in the Bay Area. 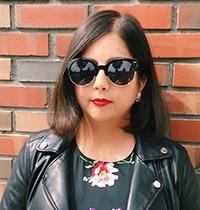 There are so many good places that I still need to check out – especially in SF! The asterisked pizza joints have more than one location that are in different parts of the Bay. Artichoke Basille’s opened up in Berkeley in 2013, so I never got the chance to enjoy as an undergrad at Cal. If you’re looking for a slice of New York for lunch or late at night, Artichoke Basille’s is a NYC-based chain. Its traditional offerings include the classic Margherita pizza and twice-baked squares of Sicilian pizza, but you can get more adventurous with the popular crab pizza (crab sauce and fresh mozzarella with a surimi stuffing), or its namesake artichoke pizza (artichoke hearts, spinach, cream sauce, mozzarella, and pecorino Romano cheese), which tastes like creamy pasta. The generous slices are all under $5 (pay cash to save 30-cents). Expect to grab-and-go, as the shop only has counter space inside and a couple of tables outside. I think Cheeseboard is one of the most reviewed eateries in Berkeley on Yelp! It’s a must if you’re visiting Berkeley for the first time. When people stand in line for 30 minutes for a pizza spot that serves ONE flavor each day, you know it’s real. It’s always vegetarian, and they rotate through ingredients like asiago cheese and corn. The line may seem long but it moves faster than you think – in part because they make the same pizza pie all day. The collective is like a co-op with the employees, and there are shared seating in the small restaurant. If you see an open spot, just take it – no matter who you’re sitting next to. I’ve also seen college kids go sit i the grass in the middle of the divider, but I think it’s kinda illegal, so wouldn’t recommend that. If I make my way to Cheeseboard now, I usually take a whole pizza to go with some of the green sauces, it tastes like chutney! When you walk into spacious Jupiter (complete with ample outdoor seating and firepits), it has an art deco kind of vibe with the art decorating the wall and I’m not sure if it’s intentional or not, but a lot of the waiters were dressed up in steampunk fashion. All of the pizzas have different astronomy related names, and it’s one pizza per person! I love potatoes on my pizza after having it a couple of years ago (which you’ll see below! ), so when I saw the Xanthia on their menu, I knew I just had to order it. (And yes, each pizza has a space related name). The Xanthia has thinly-sliced potatoes, bacon (though I substituted it with chicken – which they were more than happy to do! ), garlic, mozzarella, ricotta cheese, red chili flakes on an olive oil crust. I don’t think I need to go into detail how good it tastes: bread, cheese, and potatoes – you already know. I have had Chicago style pizza in Chicago, so I can attest that Zachary’s is legit. I’m mostly sad that I didn’t take advantage of it when I lived in Berkeley! IT’S SO GOOD. Zachary’s is busy each time I’ve gone there – but I think that’s a testament as to how good the pizza is. I’ve had the mediterranean and one just stuffed with beef. They are so good! I don’t even have words to describe how much I enjoy stuffed pizza. It’s crust, layered with cheese, meat/toppings, chunky tomato sauce and repeat! When they bring it to you hot and sizzling on that pizza pan, you’re suddenly ten times more hungrier than you initially were. And then they serve you a slice, and that gooey cheese strings along. I die. 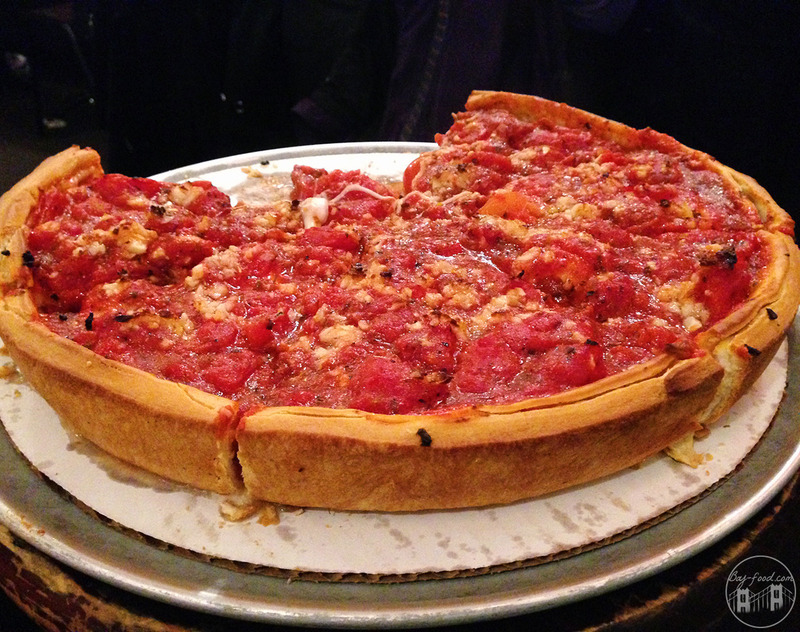 Definitely the best deep dish in the Bay. Admittedly, I didn’t eat Pizzeria Delfina in San Francisco (though that’s where it started) – I actually had it in Palo Alto when they first opened up. However, I didn’t want to leave this part of the Bay empty so it gets its own spot in all its glory! Back in 2005, Annie and Craig Still, the owners of the James Beard Award winning Delfina, opened up a pizzeria next door to bring Neapolitan style pizzas to San Francisco. My favorite thing (not surprisingly) was the Burrata Pizza. I wasn’t joking when I said I LOVE burrata cheese. This was essentially like a Margherita pizza, just replacing it with burrata – which only made it a bajillion times better. There was also additional olive oil and herbs garnished on top. I just really love the layers of creamy cheese of the burrata pizza and I feel like it takes pizza (or anything really) to the next level. Sometimes, you want to be healthy when you’re eating pizza. I know, you’re thinking “wtf?”, but True Food is both healthy and fresh, and happens to actually taste good! This was their Heirloom Tomato Pizza (grilled artichoke, roasted garlic, vegan almond ricotta, and black truffles), and it was a great, lighter alternative to some of the heavier options you see here. It’s also a great vegan option for those that follow that diet! I’m surprised I hadn’t tried Terun until last year. It’s been there for so long and I’ve always read good things about it, but it just never worked out the several times I attempted to make plans to go to here. You come here for the food-fired Neopalitan pizza, and of course I got the Burrata option. This one was different than Delfina’s (and just as delicious, if not more! ), with the arugula, pile of burrata and arugula – which is just a mouthwatering combination. Everyone really loved their pizzas that night, and we were even sitting outside and didn’t mind the crisp night! Now this place changed my life. Why, you ask? For that potato pizza. Pizza Antica is on Santana Row, and even on a weekend night, we got seated rather quickly and had a delicious meal in the chaos of people and food. Whoever thought to put potatoes on pizza is an evil genius. It’s seriously one of the best things ever. 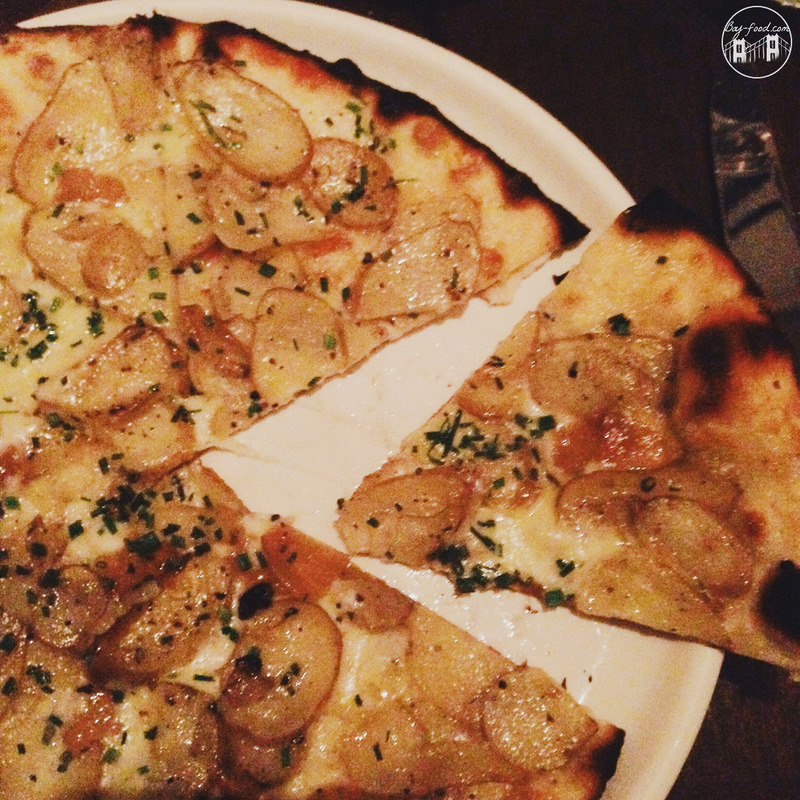 I ordered a pizza with heirloom potatoes, caramelized onions, and white truffle oil. You can also build your own pizza if none of the pre-made selections sound interesting, but this one intrigued me. The potatoes almost felt buttery but not soggy and the caramelized onions add a nice flavor as well. I literally almost finished the entire pizza before leaving the restaurant, which was not ideal since I wanted leftovers for the next day! Now I look forward to whenever a restaurant has a potato pizza option on their menu! One of the many options at San Pedro Square! You can tell I haven’t gone here in awhile because this is a terrible picture and an ancient watermark, but I still think about this pizza. 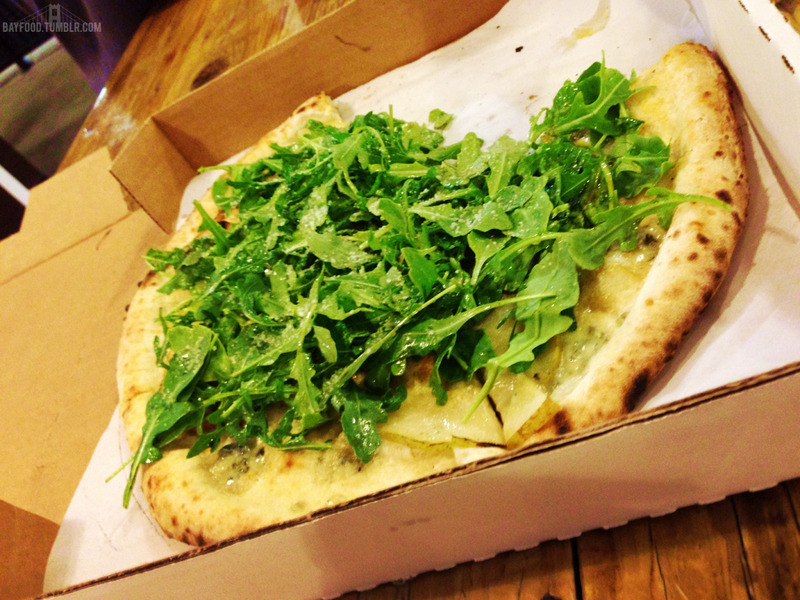 It was the first time I had a Pearzola: Arugula, Gorgonzola, Pear, and Balsamic Vinegar. I was hesitant to try it since Arugula and Gorgonzola are bitter, but my curiosity got the best of me… and I was pleasantly surprised! I think the pear helps to cut down some of the bitterness so there was a balance of flavors, so it tasted great! Now, pearzola is one of my favorite flavor combos for a pizza, as you can see with the other pies that have arugula on them. Though I had coffee to fuel up on at Abbot Square, I wanted to make sure I had a proper meal. There are several other vendors in the Square that are also great lunch options, but I was really feeling pizza. It seems like the quintessential beach town option – grab a slice and then head over to the ocean! We kept it simple and ordered the La Bufala: tomato sauce, Bufala mozzarella, extra virgin olive oil, and basil. The dough was rolled so nice and thin, I couldn’t believe it. I did have to fold it over to make sure it didn’t fall apart, but it was so good. My sister and I inhaled this whole pie so quick!